As you can see, this is my very favorite place in our paddock to stand and ‘check everything out’. I just love to follow all of the activity and different things going on at the farm. From this vantage point, I can see absolutely EVERYTHING. I just love it! Sarah wanted to come by and get an ‘end of the year’ photo of ME for Dottie to use in the DIARY….and here I was standing in MY SPOT! At night, TASTY and I do go back to the barn and stay nice and cozy. The rest of the time we are enjoying our fabulous paddock together. HMM, that reminds ME, I’d better chat with TASTY for a bit and find out about our NEW YEAR’S EVE plans! I’m sure you are quite busy making all of your plans and deciding upon your resolutions for the upcoming year! TASTY and I better get those things organized as well. The time is getting close! Love the addition of miracle whip (my mother always used it instead of mayonaise), pickle relish and the idea of finger sandwiches !!! Mine are on the stove too, fresh as well. It is not fun to have an argument when you are riding a TB, because the human usually does not win. Jethro was very opinionated, he had something to say about everythiing !!! Made life with him challenging and endearing !!! Have a great new year!!! FROM YOUR BIGGEST FAN AMY. Dear Zenyatta. You look beautiful as ever in your special yearend photo. Sarah is so kind to think of us and share another wonderful picture of you. I am so happy that you are enjoying standing in your favorite spot and watching everything that is going on. TOO CUTE!! I can see that you are surrounded by winter white, so I am glad to hear you and Tasty are toasty and warm in your stalls after dark. Tonight is the night that we take time to remember years gone by and ring in the New Year, Zenny. How fun!! As I was thinking about the coming year, Zenny, many things that you have shown me came to mind and I thought I would share them. You are such a presence in my life and I love you very much!! So here goes! Here is my list of ZENYATTA WISHES FOR THE NEW YEAR!! May we celebrate each moment of life fully, taking pleasure in the simple things (a favorite tree, a nap in the grass) and enjoying the surrounding beauty. May we remain ever curious and engaged, ears forward, showing interest in whatever is happening. May joy be present in our day and fun the name of the (hat) game. May we stay healthy by eating right with lots of fruits, vegetables and grains. A light treat here and there, peppermints are particularly yummy. And of course daily exercise, perhaps a little workout in the morning. May we show our love with a hug or a kiss and may we truly welcome friends, family and strangers alike, with heartfelt greetings. May we treasure those in our lives (just like Tasty and Team Z), being there for one another, sharing our time and giving our support. May we demonstrate great patience and always choosing to be kind and generous. May our lives somehow be “transformative” to others. May we remain ever positive and do our best, believing in the UN-BE-LIEV-ABLE, never giving up though our way seems blocked and the finish line is far ahead. May our blessings be many and our trials few, but if disappointment touches our life, may we face it with grace, trusting that for every storm there will be a rainbow and that defeat is only momentary while victory lasts a lifetime. May we rejoice in being one of God’s children and respect all of his creations with equal measure, continuing to find strength and peace from one very special “angel in disguise” among us. Happy New Year to everyone! Looking forward to March 2012 for the FIRST Zenyatta foal and our FIRST second generation jumper foal by World Cup and international jumper Flexible and out of our Secretariat line jumper mare Zebra. Hope to see Flexible representing USA in London in 2012! ONLY TO HE BEST TO ALL OF YOUR “FOLKS” ..
@Kari B, Shari, Amanda G, JSmith, Cynthia H, Karen, Maryann, Sue F, Sharon in Seattle and LouAnn – Posts for you toward the end of 407. @Shari – I am so sorry to hear about Larry. My thoughts and prayers will be with you!! @Peggy (N) – Dear Sis, how wonderful to hear your good news! What a blessed start to the new year! Our prayers were answered!! My next appointment at the Mayo is still a few months away, thank goodness! I join you in your wishes for good health to all of those who are in need. The power of positive thoughts and prayer is a wonderous thing! @Patti from South Carolina – I can’t thank you enough for the link to the HRTV special on AP Indy. It was amazing!! I have to admit when Bill Farish teared up talking about him at the end, well my eyes were overflowing also. I spent several hours enjoying all of the Inside Information videos that were available on the link, including the wonderful tribute to John Shear. Thank you again! @Granny P – Loved hearing from you!! May you stay forever young! @Abigail – At war with Star War’s and Daisy doings, too fun!! @Sue Frederick – Just like you and Gracie, I am surrounded each night with Bindi and Sassy. The bed can get a little crowded but they do keep me very warm, physically and in my heart! @Nancy – So happy you got to visit with everyone at Barn 55, one of the most wonderful places ever!!! @Barbara Wood – Thanks, Noel is such a cutie! @To All Who Continue To Share Wonderful Links – Thank you so much!!! Thank you lovely Dawn! And may they come back at you three fold – YOU, an Angel in disguise, and none as beautiful. @Dawn Conrad–lovely sentiments. Thank you! Also please let us know about Larry. Happy New Year ! to you all. Zenny, love your new photo…you look fabulous. Best wishes to you, Tasty, and all your buddies at Lane’s End Farm. Three years ago: Since mom passed on, tell my brother to remove both his old cars from my driveway, that mom let him park 10 yrs before, because his own driveway was full already. Ignore my sister-in-law’s recommendation that I just “accept” the cars in the driveway, as they “came with the house”. Two years ago: Convince my brother to sell his old brown rust-bucket mechanic’s truck, that hasn’t been driveable for years. Then watch as the two guys who bought it, attempt to muscle it up a ramp onto a trailer, failing repeatedly — but it’s out of my drive and life. Last year: Finally convince my brother to sell his 1940 desoto “fixer-upper”, that has sat in the drive for nearly 13 yrs. now — which he attempts to sell online. This year #1: Have the unsold desoto hulk towed away, freeing up the driveway for its natural purposes, like moving trash-cans. #2: With the driveway free to access the backyard, start using a machete on the overgrowth, and use my brand-new “grandpa’s weeder” with the foot pedal, to pry up the LARGE weeds in the back, as it’s easier than using a mattock (or pickax & shovel). #3: Get my brother to “mow the lawn” in the backyard, as partial payment for years of driveway vehicle storage/blockage. #4: Since the lawnmower has a starter cord that I cannot pull hard enough or fast enough to actually start the mower, buy another lawnmower. #5: Keep up the lawnmowing myself, to prevent having to revisit the machete-weeder cycle next year. #6: Sing Hallelujah! if some of this gets accomplished before next December. I just love your picture! Wishing you and Tasty the best. Happy New Year to all your fans. Love to Z and z.
Hi Zenny: Wow 2012 is really going to be a year to look forward to. Lots of exciting things are going to happen!!!!!! Let’s ring in the New Year and all of the wonderful blessings it will bring. @JAG: We didn’t see the barn cats until we were leaving. There were just two. Steve said that they had taken some over to Santa Anita, and others had just left. @Peggy (N): YAY!!! Now – plan to be at BC 2012 so we can celebrate with you! Dear Zenny, My, you take a gorgeous picture! Wishing you and Tasty a happy and wonderful New Year! Love, Jean. Happy New Year to one and all! 33 min. of 2011 left here in L.A. I hope the new year will bring better news and health — too many people I know have had or are now suffering tough illnesses, or other hard losses of friends, human & animal, and it all hurts. So I wish for healing, for all of that. 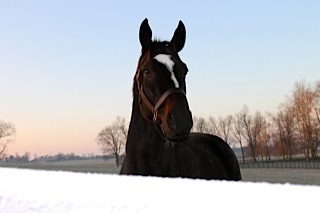 Zenyatta, I hope that you had a very nice New Year’s. I had to work, but I got off by 10:30 and got downtown by 11. I see that your diary has a new format. I thought at first that the computer wasn’t working because I couldn’t access the old format. Problem solved. Have you made any New Year’s resolutions? Maybe you don’t need to because you’re pretty great already. Happy New Year!